By this logic, we should blame horror movies for increasing the number of random animal and monster attacks. We should blame spy novels and movies for the increase in spying and acts of sabotage. And romance novels should get the blame for the ever-increasing number of divorces in the country. Nuclear power, supposedly clean, plentiful and efficient. Except for the radioactive waste which can take 50,000 years to decay into something less dangerous to the environment (lead, which by the way is STILL technically toxic). And if a nuclear power plant happens to be someplace along a shoreline, such as the Fukushima Daiichi Nuclear Power Plant, and should it experience a nuclear meltdown or a radiation leakage due to say a natural disaster, earthquake or tsunami, it could spew radioactivity into the oceans, affecting plants, animals and people all around the world. Did I mention the waste product of nuclear reactors is the primary ingredient used in thermonuclear weapons (aka: Plutonium)? Okay, you might consider this an extreme case of a technology worthy of being feared. It isn’t the technology that’s the problem. It’s how we use it that matters. Nuclear power is relatively safe if certain design parameters are followed. In the case of the Fukushima Plant, known design flaws which were not corrected helped precipitate the radioactive disaster. As far as I can tell, more than half our technology flaws come with spending too little on a technology or too much on the wrong features without placing a limiter on how expensive a technology can get. The problem lies in the underlying structure of the Humanity involved with our technology. We are afraid of technology because of how ubiquitous it is. We are afraid of how prevalent technology is and how we are becoming more unable to solve problems without adding more complex technological applications to the mix. We no longer have a choice as to whether we should use technology, it is here to stay and can only grow more complex in its long-term effects and unexpected consequences in our society. We are afraid of how dependent we have become on technology. We continue to reduce educational spending; overall in the US we spend less on education per student than we spend on keeping the average prisoner in jail per year. Our news, political and social structures are becoming more stratified. They are being manipulated to affect social groups creating division among groups and undermining social unity; these forces include inequality, racism, environmental effects on social groups, war and political polarization. America is spreading its culture of non-cooperation, religious hysteria, cultural xenophobia and underdeveloped educational capacities which promote the idea that technology is bad and rituals and behaviors from the pre-technology days are good and will save humanity. What we need to do is stop blaming authors for writing dystopian fiction as potentially being the source of a viral infection destroying society. It isn’t that powerful. There are too many real things affecting society for science fiction writers to worry they are to blame. 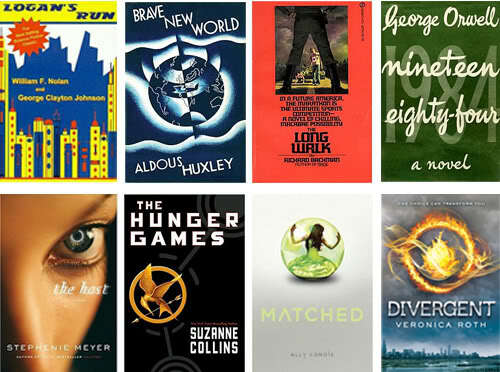 Dystopian fiction serves several purposes which should be considered on their merits. Nineteen Eighty Four posits a omnipresent surveillance state in which every citizen is able to be completely followed. The novel didn’t cause the condition, it just posited what such a world might look like. Funny. Orwell was right, it’s starting to look just like he predicted. In Logan’s Run, the society’s program of ritualized euthanasia dealt with the issues of overpopulation and what a future society might be forced to do in order to keep from overwhelming Earths’ ever-dwindling resources. The Hunger Games challenges the notions of social control, regulation and stratification of society along with class and social inequality which eventually lead to revolt and social disintegration. What we need to do is stop blaming writers for creating dystopian stories which illustrate potential futures where Humanity is wallowing in their filth because we are too entrenched in political sophistry to address issues affecting the entire planet. The writers are not creating the conditions, they are projecting an aspect of our modern society into the future and talking about possible ramifications. Good speculative fiction gives you a lens into a possible future to address a problem and maybe to begin planning a solution before the problem becomes intractable. Alan Lakein said: “Planning is bringing the future into the present so that you can do something about it now.” That is the mission of the speculative fiction writer and dystopian futures are one way of looking ahead. We have plenty of problems that need addressing and few dystopian novels address them all. Dystopian fiction writers did not create the conditions which allow these failings of the human condition to flourish and abolishing those books will not suddenly make these issues go away. Issues such as resource depletion, destruction of virgin forests and oceans, rising planetary temperatures, environmental pollution and unneeded genetic manipulation of plants and animals; financial market manipulation, corrupt economic structures, income inequality, racial and cultural xenophobia and intolerance, diseases, both Old World and newly antibiotic-resistant, and everyone’s favorite; perpetual warfare. Realistically speaking, this isn’t even the whole list. There has been significant press particularly lead by David Brin and other speculative fiction writers on the idea science fiction novels have become too negative, too dire. They are painting futures in which the bleak prospect of survival is one of an inexorable decline into utter hopelessness of a better future. And they’re partially correct. Dystopias rarely solve the problems presented. If you’re lucky they unbalance the status quo and the story ends with a move toward something different and hopefully better. That’s as good as it gets. Rarely do you see a society vastly improved than the one the story starts with and if it is better than ours, we don’t get a roadmap so we can get there from here. Dystopias are slice-of-life stories about protagonists struggling against the forces of their current society. In the Book of Eli, the main protagonist spends the bulk of the story struggling to move a bible into an archive while avoiding people who might want to try and weaponize the messages of hope in this last copy of the Good Book. In The Road or the Mad Max series of movies, there is no future, there is only NOW. The world does not appear to be able to improve, things are just spiraling into entropy. But you cannot blame authors for this. It is hard to find a time where it didn’t look like the future was spiraling right down the tubes. Each era has a moment where it believed there was no future on the horizon. We are uniquely blessed and cursed with the power to completely alter the face of the world in a single human lifetime. David Brin’s central tenet is a good one. We need more hope for the future. And if you want to write more hopeful books, DO SO. God knows we need hope. But hope alone doesn’t fix anything. You will have to put your back into it. Effort, not words make for change. We need to create hopeful stories, then go out into our communities and vote for intelligent candidates who will make change not based on their fears. We need people who will consider making changes which can improve the future for all of us, not just some tiny percentage of us. People who will dream of a future we can look at and be proud of. One filled with the light of Humanity’s best efforts, not its worst deprivations. Utopias are much harder to write because science and technology evolve so rapidly, an idea becomes dated and social trends change society so quickly, a writer’s ideas go from being etched in stone one year and etched in flame in the next. That doesn’t mean we shouldn’t try. Concentrate on creating a world worth achieving. Think those ideas that are currently unspeakable due to politics, social or cultural mores and challenge them. Make them go away or turn them on their heads and run with it. The future may one day depend on you to create an idea whose time has finally come. What’s needed are speculative blueprints. Stories, visions, dreams, plans about a future worth achieving, not just futures worth avoiding. Dystopia is only half of the equation. Go and write yourself a Utopia that inspires a future like Gene Rodenberry’s Star Trek, a world of limitless opportunity for everyone involved, Human and Alien alike. And then, if it’s worth doing, get out there and build it. There’s plenty of work to go around. He maintains a diverse collection of non-fiction at his blog, A Matter of Scale (http://bitly.com/matterofscale). He is a contributor to theScifi.Stackexchange.com with over a thousand articles. His science fiction and fantasy has appeared in blogs such as Medium.com, the Magill Review, ScifiIdeas.com, and the Au Courant Press Journal. He has a wide collection of his work on his website, Hub City Blues. His speculative fiction has appeared in numerous anthologies: Awesome Allshorts: Last Days, Lost Ways, (AUS, 2014); The Future is Short (2014); Visions of Leaving Earth (2014); Mothership: Tales of Afrofuturism and Beyond (2014); Genesis Science Fiction (2013); Scraps (2012), and Possibilities (2012). He has two books: a speculative fiction collection of short stories called Hayward’s Reach (2011) and an e-book novella named Broken Glass (2013) debuting his paranormal investigator, Clifford Engram.